Georgetown Pantry Supply aspires to offer a line of everyday items that are easy on the wallet and beautiful on the eye, all the while maintaining the same quality we’d want in our very own pantries. 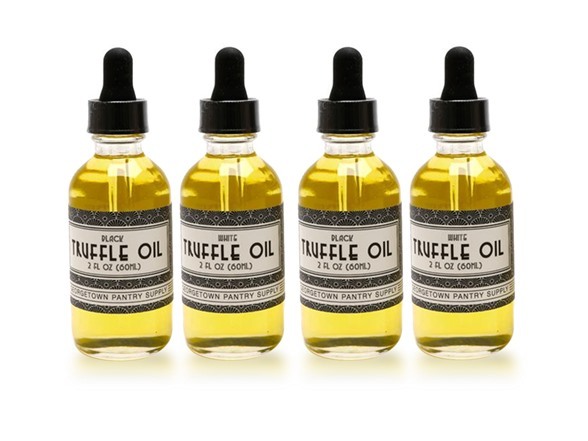 Truffle Oil... it's a thing of beauty. Truffles have an intense earthy aroma sought out by chefs and home cooks for centuries. Here, the truffles have been infused into extra-virgin olive oil, providing the perfect vehicle to add a bit of truffle to your dish of choice. It all started with mustard. Allow me to start at the beginning, beginning. Upon launching Mustard and Co. in 2013, we decided to focus on relationships with shops all around the country. We found the most special specialty stores, the friendliest grocers, the smelliest cheese shops, and the freshest meat shops. In doing so, we realized that these shops love what we love: the best products made by hands-on, crafty makers like ourselves. We also began to notice that the owners and staff of these shops are super busy, in part because of all of the lovely makers that they maintain relationships with. And so, we decided, why not take these two observations and make them a bit easier for everyone.